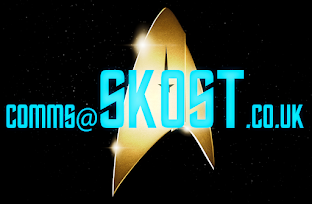 A special issue of a ship that appears for even less time than the reboot Klingon Battlecruiser. Yes, honestly the 2nd Class Neutronic Fuel Carrier formerly of The Wrath of Khan plus quoted about more times than I've had hot dinners was never physically seen in 1982 but when JJ got his hands on the franchise we were privy to few fleeting seconds of footage inside the simulator that finally put a "face" to the name. 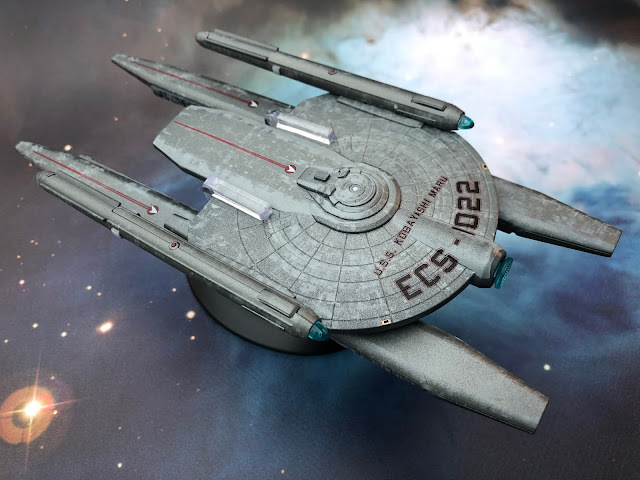 The craft we have from Eaglemoss this time is actually not screen accurate but rather what the finished ship would have looked like if it had been fully realised beyond those snatched glimpses on a viewscreen at the back of the scene and I've got to say, it's not a bad shout. Bearing one of the thinnest profiles of any ship in the collection...ever, the USS Kobayashi Maru is a hard one to review when you don't really have substantial screen material to work from. However, the work put into creating this as a fully realised edition of the series has to be admired. For one the choice of paint finish is sublime. 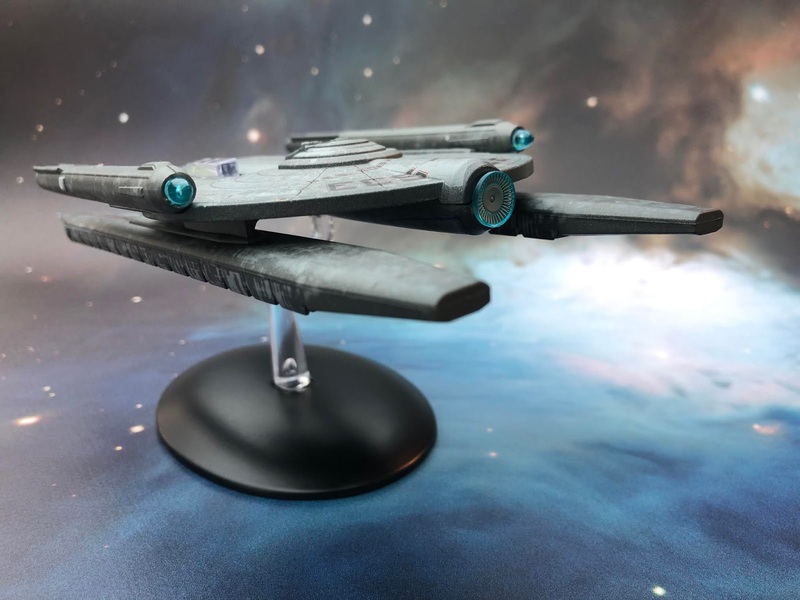 The two shades of grey used work amazingly well with the lighter shade piercing through the darker top coat and giving almost the whole ship - cargo pods and all - an excessively used look as though the top layer of paint has worn away from the hull. It's beautifully uneven, scuffed and marked adding a sense of age to this infamous craft. The hull panelling is itself very impressive on the upper saucer/primary hull section. There's even a good level of detail around the central bridge module with differing heights of metalwork and continued use of the aged paint finish even on the smallest of areas. 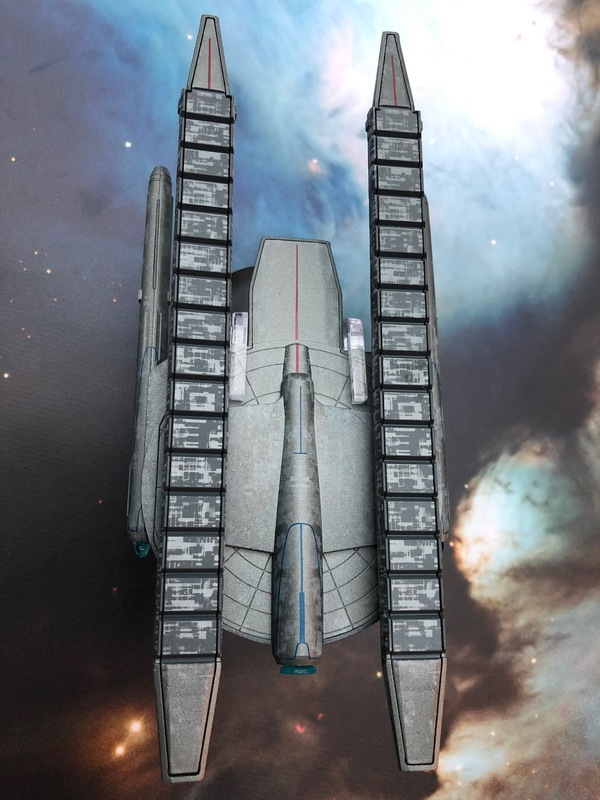 Hull markings themselves are kept to a subtle minimum with onyl the ship name and registry to the front while a Starfleet pennant streaks away to the back from behind the bridge. At the front is perhaps the weakest element of the Kobayashi Maru in the very plasticy deflector dish which, although translucent, just looks a little cheap against the rest of the decent work on the cargo carrier. To the back of the main hull we have two cleanly painted in impulse engines. Considering the size of these exhaust ports they're been precisely marked in given that there is only a very small grilled area for each. Oddly for such a craft we have the warp engines attached to the edge of the main hull. Slim, tipped with translucent blue bussard collectors, these nacelles are very well made and quite strong even though they extend back from the hull for a distance that you would think would make them susceptible to bending. Fortunately not but notably these two engines are devoid of the mottled paintjob that covers every other surface. The panel detail on the warp nacelles is lovely but the point that they are finished totally different to the rest of the Kobayashi Maru does draw your eye. The metal primary hull is inset with a plastic ventral section when you flip the ship over. The mottled paint work is very subtle on the hull which contrasts rather fiercely against the strong tones of the two cargo pods that run underneath the ship and almost make the main hull look as though it's just the one colour. Get it in the right light though and you will be able to see the difference. The panelling is once more very precise with the plastic inset fitting perfectly. There's no lip, protrusions or bad fitting anywhere on the Kobayashi Maru which is always nice to see especially in these bigger replicas. The underside has some decal work with panel lining to the front just behind the deflector dish and further Starfleet striping to the very back. Finally to the cargo pods and well worth a look from the back on this one to see that the engines, hull and pods all manage to line up exactly. There's not a line out of position here and I think you can see this not only in the way that the parts all magically line up but also in the rigidity of the craft itself. On the lengthy cargo pods there's no give at all and spot that they are actually a top and a bottom inset piece all in plastic which might be assisting with the build quality here. These two absolutely identical units (bet they were easy to mass produce) carry the strongest two tone paint finish on the vessel on their undersides which could be to indicate that they are at some point hitting the ground and wearing even more heavily. 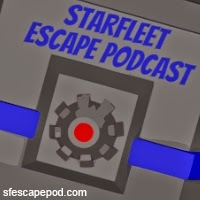 The segmenting of the pods, best seen from the underneath, is wonderful and they are realised from every angle and are even tipped with running lights and completed with another pair of Starfleet pennants. 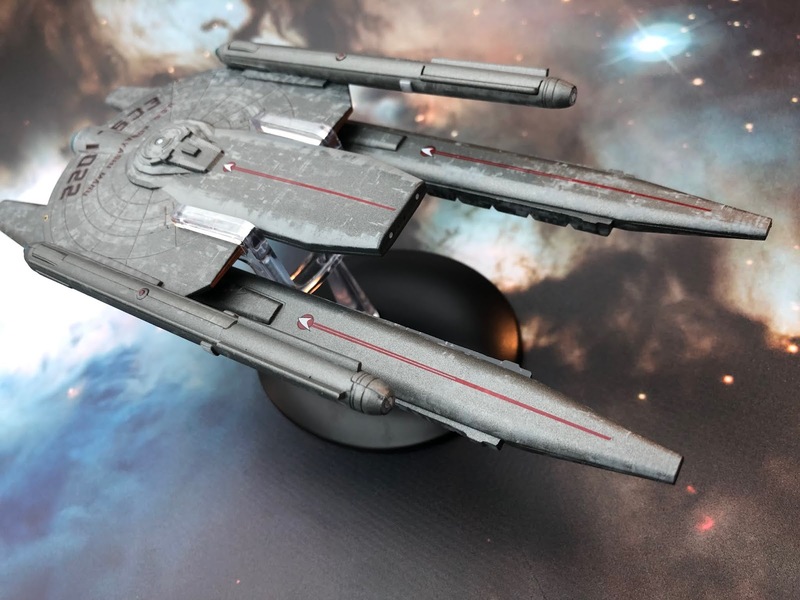 The Kobayashi Maru isn't one of the lightest ships we've seen which might be your assumption from first glance in the box but there's a bit of weight behind that lump of metal used for the upper primary hull. It looks a lot more flimsy than it actually is. Stand positioning is simply central with the clip sliding easily over the back of the primary hull and placing the ship in a good, stable display position - although I'd pick a high or low shelf so that you're not just staring at that thin profile! The 20 page magazine unusually kicks off out-of-universe talking about the appearances of the ship and references to the Kobayashi Maru within the franchise back to The Wrath of Khan and most recently in the 2009 reboot. Including sketches from John Eaves as well as screen shots from the two aforementioned movies, this gives a comprehensive history of the craft plus offers up some possibilities on what it might have looked like and even did look like according to a 1989 novel. A full eight pages of the magazine are dedicated to the work of ILM on the 2009 reboot movie from JJ Abrams. 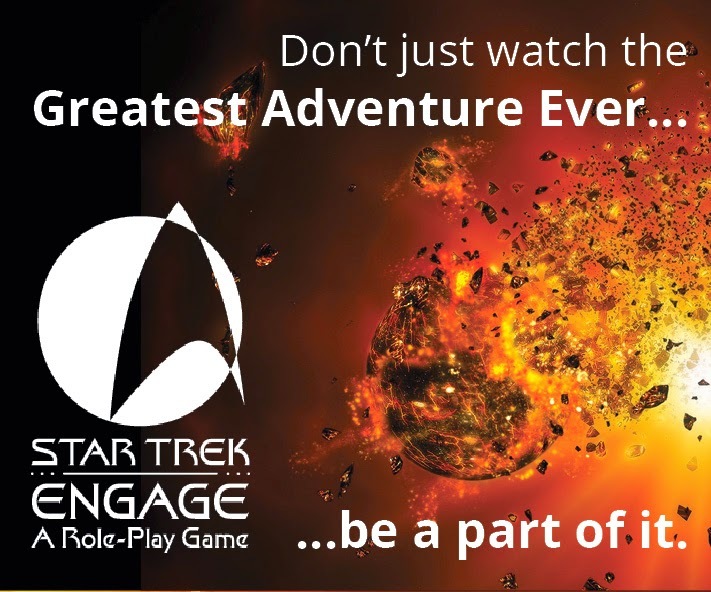 It also includes reference to their first foray into Star Trek with the Genesis sequence from The Wrath of Khan and the battle in the Mutara Nebula. Eight pages is a tight space to discuss an extensive amount of work and just how it's created for the cinematic audience. Eaglemoss have included some snapshots of ILM's work to give the maximum coverage but this is a topic begging for a nice big fat hardback book. 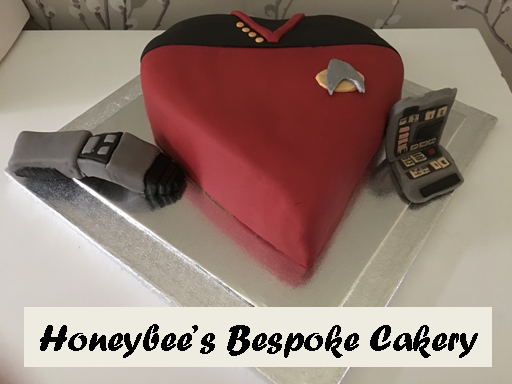 Rounding out the book is the brief story behind the inclusion of the classic simulator sequence that opens up The Wrath of Khan and how it came to be in the movie and the influence it had on the rest of the story. 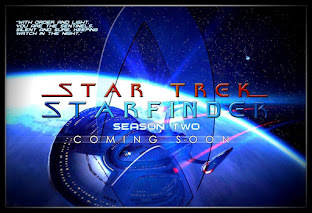 Amazing to think that such a late addition to the script would prove to be such a memorable piece of Star Trek history. 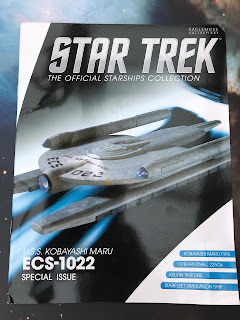 The Kobayashi Maru special might not be everyone's cup of tea due to its minimal screen impact in the form it's presented here (which wasn't exactly what was filmed) but Eaglemoss has created a great model here that does help to complete the series of ships featured in the recent Kelvin movies. I'm not glowing with wonder over her and there are a lot of the other specials which I'd choose first but this is still a sturdy starship. 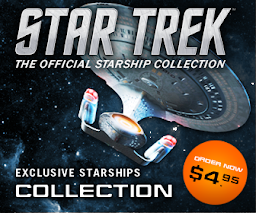 Would you recommend the Kobayashi Maru to add to your collection? How does it rate against the other special editions?